Old Time Music Cornwall host and promote American Old Time music sessions in West Cornwall. Musicians, singers and dancers are very welcome to join us as well as anyone interested in learning more about American Old Time music. We currently hold a fortnightly pub session and also arrange individual house sessions for visiting musicians that cannot make our pub session dates. A lot of the tunes that we play at our sessions can be found here in PDF format. Please download and print for your convenience. Out of the Blue Porthleven. This is a really fine pub and is ideal for our needs with good ales, plenty of seating, an out door area and caravan & camp site. Our sessions are beginner friendly and we welcome new players, singers and dancers to join us. The key instruments are fiddle and banjo, usually backed by guitar and if available a double bass. However any combination of instruments can be used and it is not unknown for mandolin, banjo-uke, harmonica, jaws harp, dulcimer, autoharp and bones to be played in a session. Percussion is usually supplied by a dancer, flat footing. Other instruments are sometimes tolerated but cannot be guaranteed a welcome at an old time session. Please arrive on time to the session and get tuned, don't be afraid to ask the lead fiddle player what key everyone will be playing in. 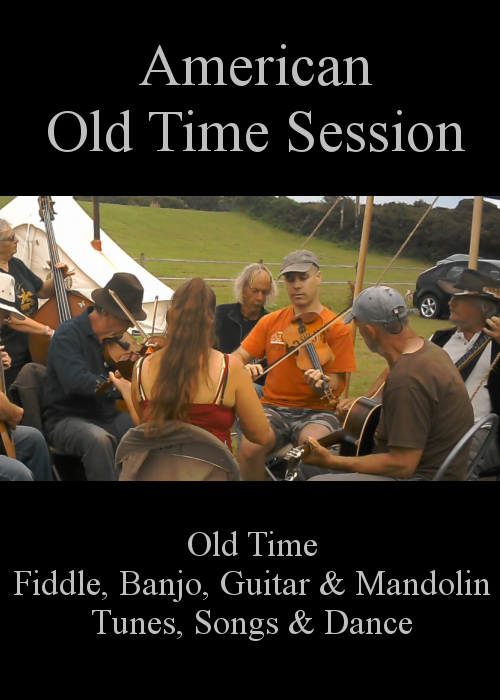 Old time session music is always played in one key until it is decided to move on to the next key as generally fiddle and banjo players will not want to re-tune instruments to a new key every tune. Old Time music is undoubtedly fiddle led. A fiddle player chooses the key and the tune 99% of the time and all of the other players support the tune with melody or chords and help to maintain the rhythm. Occasionally if there is a melodic banjo player at the session the banjo will start a tune, but if the fiddle player does not know the melody it can be difficult for a fiddle player to learn "on the fly". There are no breaks for individual players although this does not mean that you cannot improvise as this is also a part of old-time playing. Old Time is social and not performance music so we are playing for ourselves and for each other, often sitting in a tight circle or in the onion arrangement where the strongest players are at the center of the session. We are not facing an audience but listening and focusing on what the lead fiddle player is doing. Old time songs and ballads have to be played in a key that suits the singer. The volume of the instruments should be lowered during the sung parts and never played louder than the volume of the singer. Some old time tunes have just one or two lines of words, lyrics can be added to by anyone that knows a different part as there are often variants. If you don’t know a tune, listen a couple of times around, then play quietly until you get the hang of it! Once you know how the tune goes, play at a volume that fits in with the other players and never playing louder than the lead fiddle player or singer. Never miss out on what's happening! Do you know of an American Old Time event in Cornwall that you would like added to this site?